Ultrasonography is based on the same principles involved in the sonar used by bats, ships at sea and anglers with fish detectors. Also called ultrasound scanning, it is a method of obtaining images from inside the human body through the use of high-frequency sound waves. The reflected sound wave echoes are recorded and displayed as a real-time visual image. No ionizing radiation (x-ray) is involved in ultrasound imaging. Obstetric ultrasound refers to the specialized use of sound waves to visualize and thus determine the condition of a pregnant woman and her embryo or fetus. 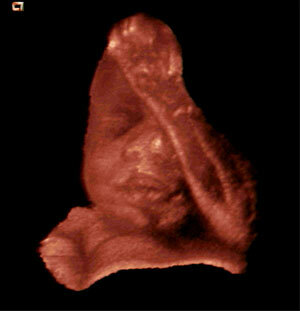 Millions of expectant parents have seen the first “picture” of their unborn child with pelvic ultrasound examinations. Ultrasound is a useful way of examining many of the body’s internal organs, including but not limited to the heart, liver, gallbladder, spleen, pancreas, kidneys and bladder. Ultrasound images are captured in real time, and they can show movement of internal tissues and organs and enable physicians to see blood flow and heart valve functions. This can help to diagnose a variety of heart conditions and to assess damage after a heart attack or other illness. These real-time images can also be used to guide procedures such as needle biopsies, in which needles are used to sample cells from organs for laboratory testing. Ultrasound is now being used to image the breasts and to guide biopsy of breast cancer.